I don't have enough 91°-appropriate handmade-by-me clothing to do memademay, but I love the idea of broadening the make/craft focus away from the starting/doing and into the using. How else can I reach out my awareness and use the things I make? I do a lot of kitchen-oriented making, and I use the things I make regularly. Daily? Add that to the list, but it's not in the same spirit as wearing (because using is so much easier), so I'm challenging myself differently. Last time I counted (years ago), I had 22 WIPs. Yeah. 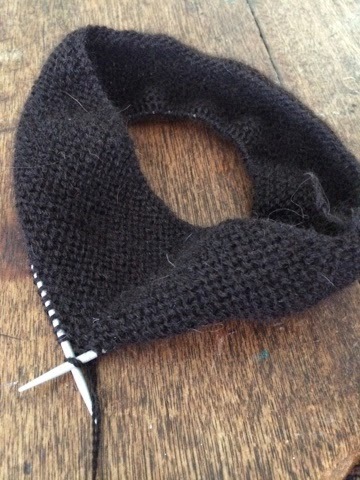 I made a soft rule: no starting something new until I'd finished or frogged two WIPs. That went okay for awhile, but for at least the last year I haven't made a point to keep track. So, my May = repurpose/finish/frog aka "FreeFiFro". Since many of my projects are large (sweaters, blankets), it's an unrealistic goal to *finish* in one day. But you can only eat an elephant one bite at a time. So instead of stashing 10+ projects in the basement and rotating half-assed between 6+ "active" projects, I'm going to focus at least one hour of undivided attention on a project—the same project—every day until it's finished, freed, or frogged. Starting today, right now, on this alpaca hat I've been debating. Debate: over. Finish and write up pattern. Bite one: go.